After a long looong time, I’m back with a mini review. 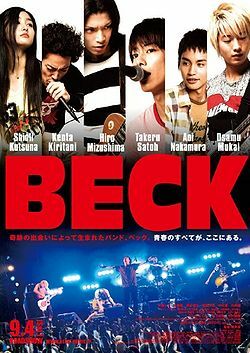 I recently watched a Japanese movie entitled Beck. It was adapted from an anime/manga of the same title. I remembered seeing one of my friends with a copy of this 4 years ago but somehow the front cover dissuaded me from ever watching it. So what motivated me? I saw an FB post of one of my unnie’s about this film saying things about Mukai Osamu, and being captivated by him, I tried to search about Beck. AND voila! Who’s not excited? LOL. The anime for me is okay, Kazehaya-kun is fine, but having Miura Haruma play his role surely is a sight to behold, he (Miura) can make Kazehaya’s character stand out. Contrary to what I expected, I did not cry (the closest were some tears). I realized that it’s because what I was watching was the fulfillment of the team’s dream, and I guess one will be happy to see one’s dream come true right (as made evident by what Kawato told Hamanaka)? 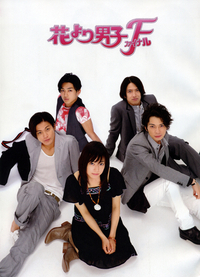 The movie focuses on the events prior to the marriage of Tsukasa and Tsukushi. Kaede-san (Tsukasa’s mom) has given Tsukushi the “Smile of Venus” – a tiara that is a precious heir loom of the Domyouji family. However, one night, it was forcibly stolen by someone. Now, it’s up to Tsukasa and Tsukushi to bring it back – failure to do so may lead to their upcoming marriage being cancelled. The chase would take them to America, Hong Kong and a deserted island (Southern part, I think). In the process, the two would learn to value their love more than anything else. As I was watching the movie, I cannot help but to reminisce the time when I’ve first watched Hana Yori Dango (that was 2006), and HYD 2 (2007), and now HYDF (2008). Really, it has been three years? Such a long time ne? But HYD still remains as one of my favorite Asian Dramas ever. As for the movie, I think it was made to completely satisfy the fans, and to fully put a good closure on Tsukushi and Tsukasa’s love story. You can not ask for more after watching the movie, well for me, all I can say is that I can finally relax and think that f4+Tsukushi are leaving their life well. I love the part where in Domyouji and Makino were stranded in the island, it’s just too sweet and romantic, I think I’m falling for Domyouji all over again. Domyouji will you marry me instead? haha. waaa. my head is aching. Koizora (Sky of love) deals with Mika (Aragaki Yui) and her life through high school. It all started when she had lost her phone, and it was accidentally found by Hiro (Miura Haruma), though Mika doesn’t know it yet. After her phone was mysteriously returned, she had received calls from Hiro (again she doesn’t know that it’s him). That started their attachment to each other. It all changed when she knew that Hiro’s the one who’s found her phone (‘coz hiro’s hair is white, and he has this air around him that spells trouble). Have watched this because sis Cindy recommended it. We were talking about Pi’s Code Blue, when Aragaki’s name was brought up. It ended with how she’s popular in Japan nowadays because of the success of Koizora (I have watched her in My Boss, My Hero and Dragon Zakura). And then I got curious. I searched the title and found out that Miura Haruma’s also there. I’ve known him from Gokusen 3, he’s cute but he’s way cuter in Koizora. Now, back to my review. Acting wise, there’s still room for improvement. It would be nice if Gakki would exert more effort into showing her emotions, so that the audience can fully feel the depth of the scene, the same goes for Haruma. It’s kind of understandable since they’re still sort of new to the acting business. Overall, their portrayals of Mika and Hiro are okay/good. Gakki looks cute, innocent and beautiful at the same time while Haruma is your typical rebel guy. Storywise, hmm, from the start I already got the feeling that someone would die (sorry if I’ve spoiled you), better to say, I know who would die, but that didn’t stop me from watching it. The story’s not new, since there are lots of movies out there involving deaths, etc. What have made me appreciate this is perhaps my teenage heart. I could understand well what those two are going through, from being inlove to sacrificing one’s happiness for the other. What irritated me most is Hiro’s attitude. Arggghh, he could just say it to her, why does he have to be all heroic. Therefore the result had been bad. huhu. I don’t hate Hiro, but his character reflects most of the characters that I’ve seen in movies/dramas, sacrificing for your love one even if it’s hurting you. sheez. Poor him. Maiko Amamiya is a shrewd public prosecutor who has her eyes set on passing the exam to become a deputy prosecutor and tries her best to be noticed by her boss. Kuryu, on the other hand, after earning a reputation for doing top-notch work, is transferred to Amamiya’s division, and finally opens his eyes to the possibility of promotion. Unfortunately, his unprecedented work behavior abruptly brings things to a halt. Honestly, I’m a little bored at the way things are going, it has a great storyline, yes, but I guess I’m not that into the world of prosecutors, and one of the best factors on why I’m somewhat bored is the video quality. This series is kinda old (aired at 2001), so it’s difficult to find a HQ version. But Takuya Kimura as Kuryu Kohei rocks. I mean KimuTaku is a great actor, I now believe. 😀 No wonder those series of him always get high ratings. The SP’s better than the series, hmm, it’s perhaps the quality (haha, yet again). I’ve enjoyed this more than the former, but I somehow miss Kuryu’s former colleagues. Now, this is different. Though there are still some not so good parts but I totally liked the movie. Hmmm, great story line and it’s interesting, you get to feel the “drama” aura again. And finally, there’s a development with Amamiya and Kuryu, yay! This is my second attempt at a KimuTaku drama, first was Goodluck which aired on GMA (but due to some unknown reasons, there has been a lot of cuts). I can still remember the commercial for GL, they are saying stuff like KimuTaku’s the hottest and most popular idol in Japan. At that time, I totally disagree, I don’t even find him handsome. But after watching Hero, OMG, I can definitely say that KimuTaku’s the hottest and best guy ever (even hotter than Ryo chan and Pi). Mind you, I’ve only seen 2 dramas of his. However since he’s married and he’s 35, I’d consider him as an idol, wow, KimuTaku rocks! With regard to his role in Hero, Kuryu’s so funny, especially that TV Shopping Madness of him. And it’s nice to see a new style to prosecutors. wee. From now on, I think I’ll be marathoning Kimutaku’s dramas. So I said I won’t watch a drama show (in this case a movie). Yet, I’ve watched this. And again there are tears falling from my eyes. Have watched this because of a recommendation from a friend (thanks sis cindy). I’m too lazy to make a synopsis so I’ll just say it plainly. The story revolves around Makoto (Tamaki Hiroshi) and Shizuru (Aoi Miyuki), both have first met during college. Shizuru isn’t your average girl she’s perhaps a weirdo while Makoto isn’t that cool too, he’s so shy. Makoto’s a photographer and he introduced this to Shizuru. Things began to get complicated when Makoto was drawn to a group of “cool people” which includes his crush Miyuki. So I’ll stop here. The story’s beautiful. And as expected it has “that” ending, I thought I wouldn’t cry but I did. At first, I wasn’t that interested in watching but as I continued, things began to get pretty good. One thing I’ve noticed, Tamaki looks like Toma-kun in here, I don’t know but everytime I see him I remember Toma. But I prefer Tamaki as Chiaki (Nodame) than Makoto. I’m a little frustrated in this film because I feel that Shizuru’s so pitiful, I know she’s happy at how things ended but I would have liked it more if she and Makoto have their “moment”. The ending’s great, the part where in Makoto is in the gallery and the time where in he sees the “photograph”, ahh and the words ~ that was sweet. I can’t talk more. This movie’s nice.